I don’t really know where to start with Buster Keaton. He’s terrific in everything I’ve seen him in, and subsequently, it’s difficult to outright criticize his efforts because his presence adds so much to something so minimal. Perhaps that’s his appeal? He injects so much humanity into ideas that are usually bare. It’s only in something like Sherlock Jr. did I sense a greater philosophical framework being exercised. And even then, it all mounts into something so intrinsically human and universal that one doesn’t really gather a greater sense of where Keaton himself stands. Seven Chances succumbs to that sense of contained humanity – which should not be construed as a negative. 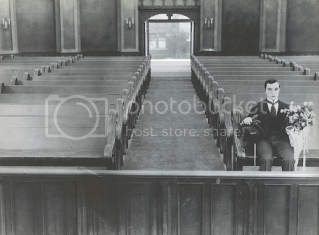 No, Seven Chances may not be top-tier Keaton, but it’s still evocative of something very emotionally astute. The premise is straightforward – Jimmie (Buster Keaton) loves Mary. The seasons change, yet he simply cannot muster to courage to ask her out. Time lapses forward where we find that Jimmie’s business is on the brink of financial ruin – up until he is presented with his deceased grandfather’s will. The will stipulates that Jimmie will be able to collect seven million dollars so long as he marries by 7:00 pm on his 27th birthday – the very day that he receives the news. A misunderstanding compromises Jimmie’s efforts to propose to Mary, therein making things a bit more complicated. Seven Chances' narrative plotting isn’t quite as ambitious as some of Keaton’s prior (or later) films, but it works in filling a particular void that I’ve found Charlie Chaplin to cover well. 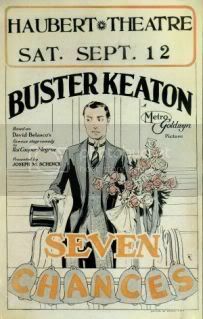 Seven Chances, outside of the ending’s spectacular chase sequence, is less physically demanding of Keaton than any other of his films. So with that, there’s a greater demand for Keaton to flex his acting and stylistic muscles. He does so admirably, as always making for a convincing underdog who is love struck. A sequence that sees him getting rejected by several women forces Keaton to use his camera within a close space – it’s a terrific example of how visually incisive Keaton was behind the lens. A woman sits at a balcony, we pan down to Keaton writing a note asking for her hand in marriage, we have a wide shot of him tossing the note up at her, followed by a close-up of Keaton being sprinkled by the note, now torn to shreds. It’s the sort of straightforward scene that could’ve been framed in so many ways, with Keaton going about it in the most honest and formally perfect way possible. As a whole, Seven Chances misses the mark when it decides to do away with the plot and succumb to some of Keaton’s more visceral and physically demanding exploits. His chase sequences are typically great, but it’s all the sort of thing that I’ve seen in some of his other films (most notably Cops), that it detracts from a cute, if not traditional, narrative.